Today is my company’s three-year anniversary. 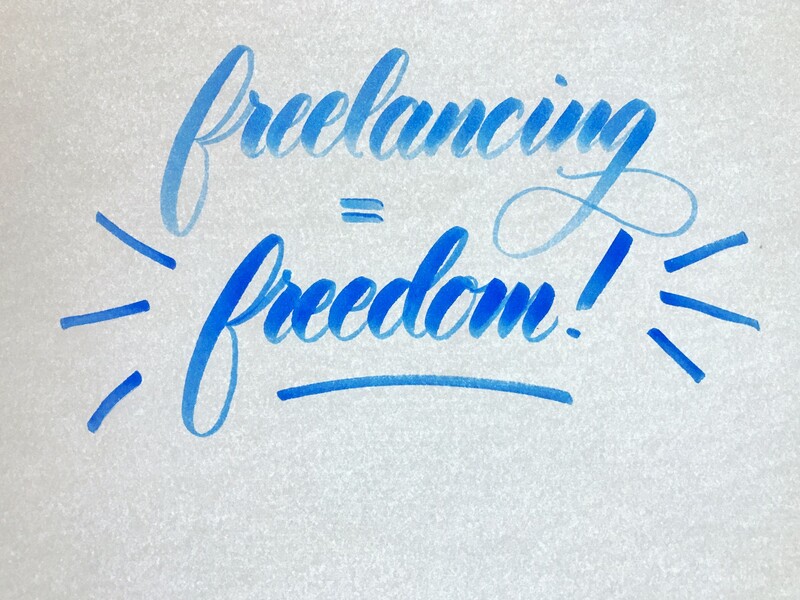 Since anniversaries and birthdays always give me food for thought, I figured I’d write a blog post similar to the one I wrote one year into freelancing. So in the following paragraphs, I’ll be looking back on what I’ve learned and to the future of where I want to go. Here are some things I learned about running a small business, clients, and myself in the past three years. I guess the most important realization I had was that I’m good at what I do. This sounds unbelievably pretentious, which is not my intention in the least. But the past years have really shown me that all the effort I put in my work pays off – my clients are happy and I receive lots of word-of-mouth-recommendations, which is just about the nicest thing that you can have as a freelancer. Language is my life. Everything I do professionally has to do with language. I still love workshops. I don’t think my hunger to learn will ever subside, which makes for a busy schedule and a long resumé, but also for lots of knowledge and resources I utilize for my clients. My mom still has no idea what I do all day. After three years, choosing my clients comes quite naturally; my gut instinct is spot-on. The challenge that still persists, however, is coping with the loss or gain of clients or commissions from one day to the next and planning your schedule around this without ending up working nights and weekends. Whoever tells you you can’t make money off of what you love: don’t listen. I love teaching basic and adult education, just like I love editing and translating. None of these professional endeavors are well-paid or even appreciated in society, and yet—my freelance business is thriving. Taking the risk and jumping into freelancing really paid off. If there’s a couch in the room, I’m still going to sit on it. Even more so, now that I spend parts of my day standing in classrooms. I’ve started reading some of the books I previously just bought and never got around to reading on the commute to my office. I find reading soothes my ever-working brain. One thing I have come to notice that I didn’t use to think was important: I love weekends. Simply because where I live, everything slows down on the weekend. People stay home if the weather is bad, or they go out hiking/swimming/whatever healthy people with regular schedules do if the weather is good. It’s twice as much of a challenge to go to the office on those days, and I try to avoid it as much as I possibly can. Apart from being an editor and a translator, I am a teacher—whether I like it or not. Teaching makes me happy, even though it is a constant source of concern: for my students, whether or not the material will be well-received, how long my class will run for, etc. I’m still working on getting around my perfectionism. It’s very helpful in editing and translation (I want to find just the right word), but it’s not so great for teaching or creative work. I no longer feel like I’m not ready to take on jobs. I receive constant positive feedback that gives me enough confidence to try new things and also to know what I’m really good at. I’ve learned to take on a laissez-faire attitude: if I get the commission, I get it; if I don’t, I don’t. What I do know is that I won’t accept it unless I’m positive I can get my best work done. Freelancing is real, full-time work. It can be time-consuming, relationship-consuming, it can cause insomnia and if you’re not disciplined, you might fall out of any routine that previously came easily to you (like eating breakfast, working out, sleeping the same amount each night). But being able to do what you love, getting direct appreciation for it, and being able to freely choose your schedule and your clients makes it all worthwhile. For me, the mixture of teaching, where I’m in direct contact with my ‘clients’, and editing and translating, which is more solitary work on texts, is just right—one that I will never find as an employee. 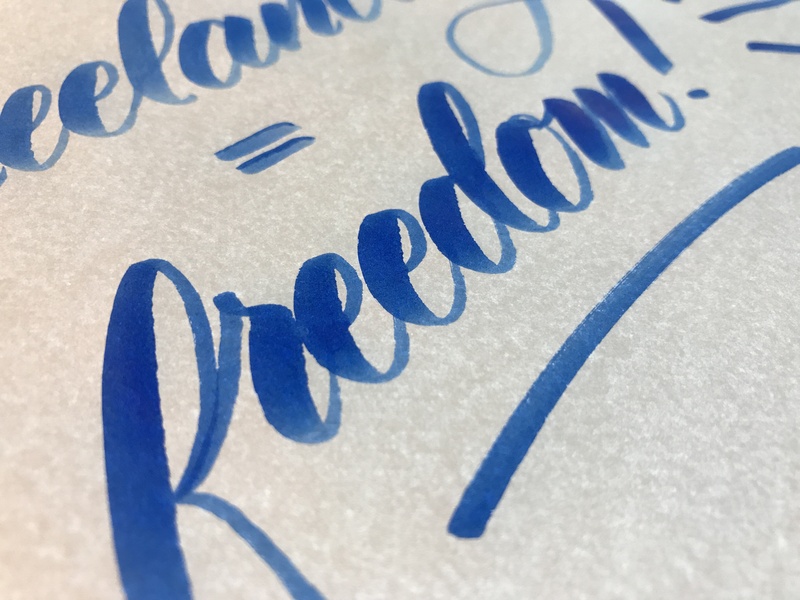 To sum it all up: freelancing is freedom, and I’m looking forward to the next years and decades of it. close up of the lettering for this blog post’s cover. done by me with Sakura ZIG Brushables.